Amy and our driver Nyoman explore the interior of Bali. 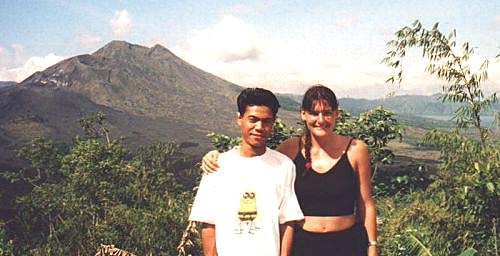 Mount Batur is our first stop. This active volcano last errupted violently in 1917 and again in 1927 destroying 60,000 homes and 2000 temples. Seems like a lot of temples you say. 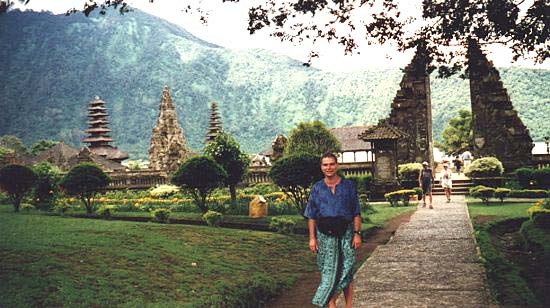 The Balinese have four temples in every village and every family has their own temple as well. We enjoyed having Nyoman for our driver so much, that we hired him for four days for about $120. Not bad when you consider it includes car and gas. I have included his card below in the event you are going to Bali.